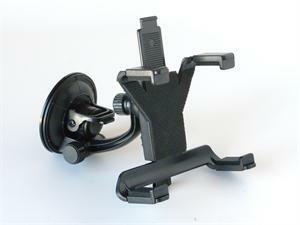 * 7 to 10.1 inch Monitor / tablet / iPad windshield suction mounting bracket. * Adjustable holding bracket, can be extended from 4" to 7&3/4" , Suitable for 7-10.1 inch tablet,such as Samsung Galaxy P3200,Galaxy Note 10.1,Google Nexus 7 etc. * 3.5" diameter suction cup base , can be mounted on windshield or any smooth surface. * Tablet in the picture is not included. * This bracket does not suitable for devices smaller than 5&1/2" x 4".